inspire me. I hope you'll visit often! view my portfolio please visit my website. Please subscribe to stay in touch! Design Sponge – What's In Your Toolbox? I wanted to share this birth announcement that I created for a friend/colleague. It is inspired by a wedding invitation design that I did, featured in Brides Magazine, last year. The theme was “vintage schoolhouse” printed on old school paper, mounted to old file folders, and packaged in manila envelopes. The look had such an old fashioned sweetness about it… also perfect for a birth announcement! 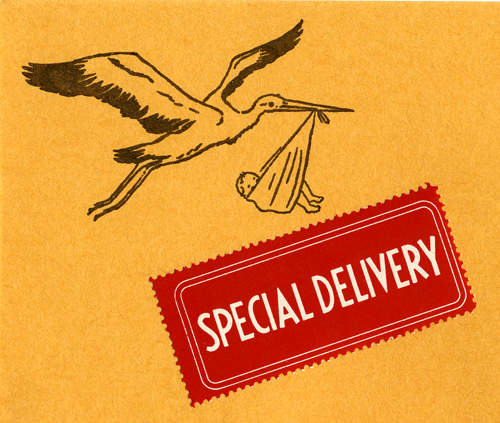 On the front of the envelopes I silkscreen printed my stork illustration and found the perfect use for my vintage “Special Delivery” labels. 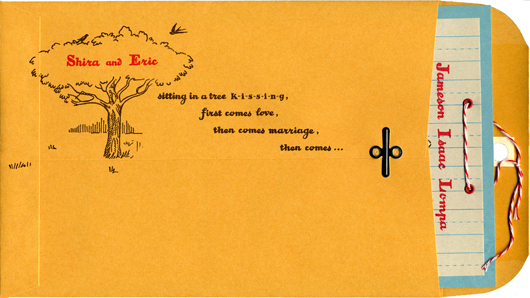 On the back of the envelopes I played with the same “schoolyard song” as I had for the wedding invitations, only taking it a bit further… first comes love, then comes marriage, then comes…. Jameson! I had so much fun creating schoolbook-like illustrations and hand-lettering. Using a clock for the time of his birth, a scale for his weight, and a ruler for his length measurement. 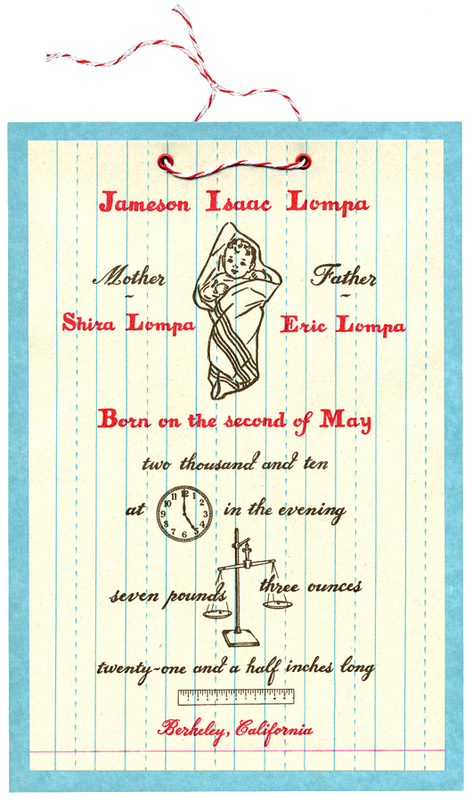 I like how the parent’s names cradle each side of my baby Jameson illustration. What is the name of typography? All of the lettering I created by hand… inspired by vintage children’s school books.